Hewlett Packard Enterprise Services (HPES) has been awarded a contract by the US Navy for the next-generation enterprise network (NGEN) programme. Under the $321.6m indefinite-delivery indefinite-quantity, firm-fixed-price, fixed-price award fee contract, the company will establish the next-generation enterprise network to replace Navy Marine Corps Intranet (NMCI). Currently, NMCI provides end-to-end, secure information technology services to more than 400,000 seats and 800,000 users. US Navy Research, Development and Acquisition assistant secretary for Sean Stackley said the NGEN contract would provide continued IT operational support, as well as create a path towards aligning with the US Department of Defense’s (DoD) joint information environment (JIE). The US DoD’s JIE initiative aims to improve operational efficiency, enhance network security and cost savings through reduced infrastructure by merging multiple enterprise networks into a common global network. "The NGEN acquisition approach will allow sustained competition and significant savings for the department," Stackley said. "The NGEN acquisition approach will allow sustained competition and significant savings for the department." In order to meet evolving security requirements, NGEN will increase government operational and design control of the network and requisite information assurance enhancements. The HPES team for the NGEN contract includes AT&T Government Solutions, International Business Machines (IBM), Lockheed Martin and Northrop Grumman. Work under the contract will be carried out at nearly 2,500 Navy and Marine Corps locations worldwide including major bases and single-user sites, while the network services will be provided by the navy under a government-owned, contractor-operated model. Based on the HPES Combined Enterprise Services and Transport Services proposal, the contract marks the next phase of US Navy Marine Corps Intranet (NMCI) services and also includes four one-year options, which if exercised would bring the total value of the contract to $3.4bn. The contract is expected to be completed in June 2014, but it may also extend through to 2018, if all options are exercised. 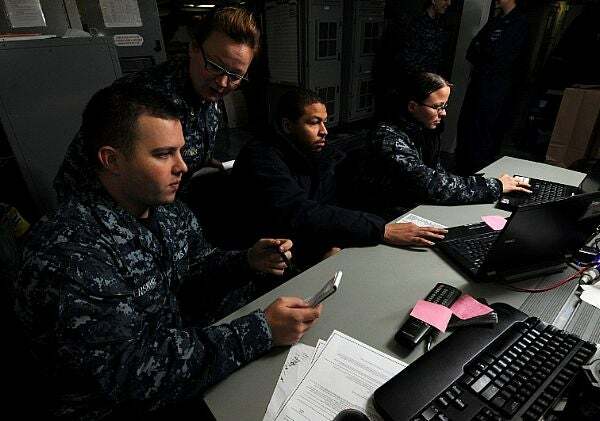 Image: US Navy personnel assessing the computer networks security of USS George H W Bush. Photo: courtesy of US Navy, by mass communication specialist 2nd class Leonard Adams Jr/Released.